Ontario Conservative MP Erin O'Toole says he's not ruling out running as a candidate in the Ontario Progressive Conservative leadership race. 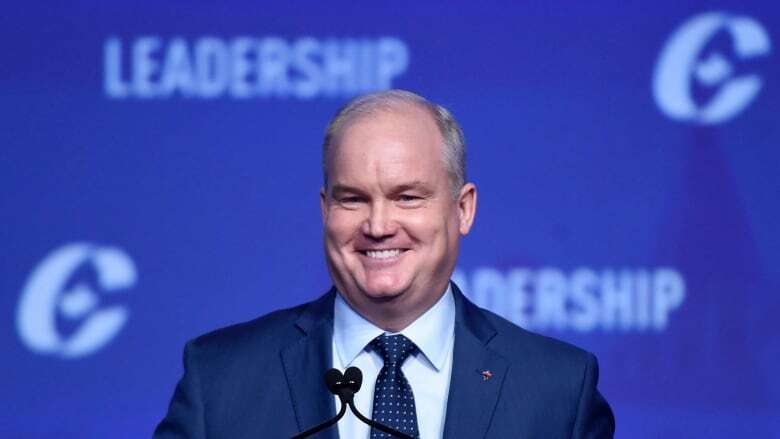 Ontario Conservative MP Erin O'Toole says he's not ruling out a run for leadership of the Ontario Progressive Conservative Party. "I'm talking to a number of people. I'm not ruling out being a candidate," O'Toole told reporters Wednesday. O'Toole, first elected federally in a 2012 by-election, ran for leader of the federal party last spring. He placed third behind Andrew Scheer, the ultimate victor, and Quebec MP Maxime Bernier. Since the resignation of former Ontario Progressive Conservative party leader Patrick Brown — and his close friend, the former party president, Rick Dykstra — O'Toole says he's been watching closely what has been happening at the provincial level. O'Toole told CBC News he's "hearing people out on the best way I can help the PCs through the difficult period." The party's executive council will meet tonight to decide on the rules of the leadership race, which is expected to be held in March, only weeks before a provincial election in June. "I got my start in many ways from the Ontario PC party. I have great friends, and support, and I've been talking with them about how I can help make sure we recover from this period quickly and win the next election," he said. The Durham MP said he respects how interim leader Vic Fedeli is handling the fallout, who has said he will not run for the permanent leadership but rather focus on rooting out the "rot" that has set in since Brown assumed the party's leadership. "I have a lot of admiration for Mr. Fedeli, who has said he's going to get the bottom of all the problems facing the party including memberships, a whole range of things. I appreciate the fact that he's willing to not run for leader in order to get to the bottom of all of these issues," O'Toole said. He went on to say he will be involved in the next provincial election one way or another, because he says what happens to Ontario will affect the rest of the country. "If we don't I think the whole country will suffer from an Ontario that is spiralling down. There's a lack of confidence in the business sector, the manufacturing sector is at risk," he said. Another federal caucus colleague, Lisa Raitt, has said she will not run. The only declared candidate for the Ontario PC leadership is Doug Ford, the brother of late Toronto mayor Rob Ford. Previously, Doug Ford had mused about a rematch with current Toronto mayor John Tory — Tory beat Ford by some 10 points in the 2014 race — but said Wednesday he will run for a provincial seat in the riding of Etobicoke North.